This is right around a 3.5. I think Detective Comics remains engaging and fun throughout it's series run though the best part is still the first arc for me. This one brings in the league of shadows. For some odd reason Batman believes they aren't real. Then we find out why he believes that. Then we have some side story with Batwing and Clayface which is entertaining but feels like a afterthought. The main event is Cassandra and her life as Orphan. What I liked: Anything to do with Cass is GREAT. The moments of quietness for the character really help grow her. I also love any fight scenes with her because she's the most vicious fighter on the team. Add on the fact her relationship with different people is always interesting. I also like Batwomen alot in here, she came across most relatable here. Also thought Clayface was adorable here, as he is becoming one of my favorite characters. What I didn't like: Batman's plot felt uneven. I also felt Batman was kind of dumb? Like he just seemed to be surprised and confused at everything. Also his reaction with the mayor felt offbeat. I also still don't care about Batwomen's father. So anything with him was mehish. The art seemed to be pretty bad at certain points too. Overall Detective Comics is still a must read for Batman fans. I think it balances a lot of characters pretty wall. Also the character growth of people like Cass make it well worth reading for fans of the character. The League of Shadows comes to town with Lady Shiva in charge and is looking to destroy Gotham. The League's plot to sow discord with Gotham was very interesting. However it soon devolved into the plot of Dark Knight Rises. The focus on Orphan was great. Making her fascinated with ballet makes complete sense. A genius idea. I'd love to see her become Batgirl again. Hipster Batgirl Barbara Gordon grates on my nerves.The art on this book was OK to subpar at best and didn't mesh together well at all. Even the coloring had glaring changes with each different art team. Marcio Takara's art was particularly awful. This was one of my fears with DC going to a biweekly schedule on its bigger titles. Artists wouldn't be able to keep up and the art would suffer.Received a review copy from DC and NetGalley in exchange for an honest review. *** Received an ARC review via NetGalley in exchange for an honest review ***4.5 stars. So, this volume centers around Rebirth! Cassandra Cain and her meeting with Shiva. So, I’ll get the negatives out of the way upfront: (1) This is not my favorite art. Something about it just isn’t as pleasing to the eye, to me. (2) I’m still majorly bummed that this version of Cass is not Bruce’s daughter. This version of Bruce is wary of her and she chose to name herself after David Cain, something Cass would never do because her father was an abusive prick. Sigh. (3) All of Cass’ portions are told through narratives and boxes because she barely speaks because they regressed her. While I liked the choice to use movement and art to tell her story, i’m still not pleased with these choices as a whole. (4) There’s another fade to black scene when Shiva’s fighting. Why?Onward!I loved that they gave us more of Cassie and ballet. I loved her sneaking into the studio to learn and watch the dancers! She's fascinated by people using body language to create art and not pain. I also loved Cass using the dance moves to inspire her fighting style. It was heartbreaking to see Cass unable to communicate with Harper even though she so badly wants to. This friendship remains interesting to me. I liked seeing Bruce's proud little smile when he’s talking about Cass. Bruce admits Cass would beat him. Batwoman worries about her. Bruce also talks about them taking her out to see ballet. Again, wish she was still his adoptive daughter but this was cute to see. I also really liked the relationship between Cass and Basil. Shiva has always been a very dynamic character. Watching Cass go through this situation where her mother, who she’s been dreaming of meeting, tells her she’s not worthy was heartbreaking. As were the flashbacks of her father’s abuse. So, when you separate Cass’ superior history (had to say it) and just appreciate this as a story for an entirely separate character, it’s pretty interesting. If I didn’t have the context of her past incarnation, I would probably love this even more. As it stands on its own, it’s pretty moving. Cass is a little more trusting of others, especially considering the scene with Claire, the dancer. I loved their interactions and I really hope Cass stays in touch with her. The crux of this story is Cass’ relationship with autonomy. While it isn’t as progressive as Puckett’s run, it does obtain some autonomy for Cass. She discerns, from a story read to her, that she can choose her own destiny. Not fighting to kill doesn’t make her weak: it makes her strong. She defines who she is; not her father and not Bruce. It does make me question whether they’ll let her have a real code name after this. Orphan. Especially after David Cain makes no sense at all. I’m still a little fuzzy as to what Shiva’s goal were but the ending was satisfactory. (view spoiler)[ I loved finally getting a fight scene with Cass taking down an awe inspiring amount of ninjas. (hide spoiler)] My daughter is a total badass!! There’s a short interlude with Luke and Azazel that surprised me. I was actually charmed by it and want to see more of them working together. I love the idea of an atheist/agnostic scientist that trusts in logic and reason working with a religious person. They have an interesting chemistry and I hope to see more of it in the future. The end with Tim kind of served no purpose other than to hint, once again, at the war coming. So, in some ways, this was probably the strongest, well put together arc of the series. I say that not just because I love Cass and it focused on her but because it had a beginning, middle and end and by focusing more on one character, it felt more cohesive. Still bummed that this version do Cass speaks in sentence fragments and isn’t Bruce’s adoptive daughter and the Batfam’s adoptive sister. However, as I said, if I remove that context, it’s a very powerful story. There was a time when i'd have given League of Shadows a generous three star-rating and hoped that the next volume would be better, but that was before I grew tired of poor fill-in artwork, particularly on flagship titles such as Detective Comics. I mean no disrespect to Christian Duce or Marcio Takara (they both draw better than I ever could) and I appreciate that fill-ins are necessary on the comics that DC release twice a month. However, neither of those points change the fact that this pricey collection (£17.99 here in the UK) just wasn't worth the money and their artwork was a big reason why.I did enjoy Fernando Blanco's pages (yes, the fill-in artists needed a fill-in and were outshone by him) and Marcelo Maiolo colours the hell out of the last few issues. Tynion IV's story also has it's moments (usually the ones with Lady Shiva and Cassandra Cain), but is neither as enjoyable or compelling as the first two. I enjoyed Rise of the Batmen and The Victim Syndicate to the point that I almost completely overlooked their flaws, but that just wasn't possible with League of Shadows.Both of the main art teams return at the end, but only for a couple of short teasers. Their work looks amazing, but i'm not sure which I care about less, the Azrael story for the next volume or the Dark Days lead-in for...The Forge? Dark Knights? DC Metal? I don't care.Fortunately, there's another gallery of variant covers by Rafael Albuquerque (imagine how good this arc would have looked with some of his artwork) so the book doesn't end on a completely sour note. However, when all is said and done I think I might be finished with Rebirth's Detective Comics and I couldn't be more disappointed. I realized today how very behind I am in all things Rebirth when I sat down to read the latest Super Sons event and found myself missing quite a bit of context. So it seemed like it was time to start playing catch up, so here I am, beginning with Detective Comics Volume 3. I wasn't a big fan of the last volume, and I wasn't really a big fan of this one either. Something really fractured with the loss of Tim at the end of the first volume, and I don't think the book has ever really recovered from that. The team doesn't really act like a team, and it's easy to forget about certain members. It's a shame, because I did really enjoy the first volume. Cass is the star of the show in this volume, which was one of the pros. The first issue with her dancing was a clear stand out, and was probably the best full issue in the book. The plots with the two evil leagues, though...not so much. I do like Cass a lot and I liked some of the points made about her here, but the story where she learns the truth about Shiva wasn't very interesting to me because I already knew Shiva was her mother. It's not a secret, and they really needed to make the reveal interesting in some other way. The whole plot with Shiva wanting to destroy Gotham felt very trite. Like, oh look, a villain wants to destroy Gotham for unclear reasons...again...I just couldn't get interested. Azrael, Batwing, and Clayface were hardly in this volume. And whenever Batman was around, it was usually just him being surprised and unprepared, which was very tiresome. He's supposed to be the world's greatest detective, in a book called Detective Comics, so why is he constantly being being outsmarted? It'd be really nice if he had he upper hand or a surprise advantage for once. I do still enjoy Batwoman a lot in this title. She didn't do much in this volume, but I really like how Batman treats her as an equal, and he doesn't do that often with others. I sort of hate to say it, but I'm mostly reading this to get to the good stuff, when this will all tie in with the larger plot of Rebirth. And as such, the final four pages actually felt more interesting than the whole rest of the book combined, which is just a little flashback to Tim (who I just have to say, actually showed more detective skill in those four pages than Batman did in this entire book) seeming to hint at the larger plot. Overall, I would be dropping Detective if it weren't that I want to see this whole fake-dead Tim plot through. And what's most unfortunate is that it seems as though the writers are aware of this, and have gotten a bit lazy because they know people will hang around for that. I did like Cass in this volume, but that's not enough to make up for all its other flaws. [Read as single issues]Here they come to wreck the day/town/entire Bat family - it's the League Of Shadows!This six part story brings the League of Shadows as well as their illusive leader Lady Shiva to Gotham, and then it's up to the Tec team, including new member Luke Fox, to get them the hell out of dodge. Of course, the fact that Shiva could potentially be Cassandra's mother complicates matters, as does the re-emergence of the Colony. Oh, and there's Ra's Al Ghul to deal with too. This arc is busy.And yet, this still remains the most consistent and most enjoyable Rebirth book that I'm reading. The characterization is always on point, every character gets time to do something awesome, and there are multiple storylines at play all at once - this is what happens when you give a creator a book for a long term project, and allow them to seed ideas early on that don't come to fruition until later. The art on this one is divided up between Christian Duce and Fernando Blanco for the first three issues, and Marcio Takara for the final three and the prologue story from Detective Comics #950. Takara's a little more fast and loose with his linework than I've seen before, while Duce and Blanco have very different styles that don't really gel as well as you'd hope, but overall the aesthetic of Detective Comics is preserved by the three artists, and it works very well.3 volumes in, and still my favourite. You go, Tec. I'm still on the fence about this Rebirth title, but I keeping reading because . . . it's Batman, you know? Well, Batman and his extended vigilante Bat-family, anyway.This time around the spotlight is mostly on Cassandra Cain, and she's the one who keeps it lively and interesting for the most part. As for the plot and some of the other story threads they are just passable. This volume focuses mostly on Orphan/Cassandra, with Tynion trying to develop a character that doesn't speak, no easy feat. He pulls it off well, and with lots of action, so this arc was fairly well rounded with the exception of not a lot of Batman. Primarily at the end, there's a tidbit at the end which seems to lead into the Dark Metal crossover. I really appreciate the writing spending time getting to know the characters in this series. At the beginning of DC Rebirth, both Tom King and James Tynion IV were putting new spins the Bat-mythos with their respected runs of Batman and Detective Comics. Based on their first volumes, Tynion’s Detective was more ambitious in making it more about the sense of family with Bruce Wayne pairing up with his cousin Kate Kane/Batwoman to recruit a team of vigilantes that would protect Gotham. However, it’s been over a year since DC did their big relaunch and although the Dark Knight Detective will always come out on top, every subsequent installment from this run fails to stay strong.Please click here for my full review. The plot of League of Shadows is very repetitive. An all-powerful organization comes to Gotham, makes troubles, and captures the entire Bat-crew while doing so. It's a big yawn.Fortunately, it's got character work that utterly excels and rises above that trite plot. It's all about Cassandra Cain, and it truly positions who she is, who she was, and what she represents in the nu52 Universe. It took several years, but it's great to have this innocent, damaged, monstrous human being back, and she's depicted so well in this volume.It's also nice to see the puzzle pieces of the Rebirth Detective Comics coming together, as we get more on the Colony that was so important in this comic's debut.Overall, a mixed comic, but still at least 3.5 stars. Loved the first volume in this collection, but I am liking them less and less as they continue. This volume is way too light on the Batman and way too heavy on the secondary characters that I don't fully care about yet (aside from Clayface). I realize that these stories are supposed to be building that interest in the new characters, but they're not working for me. Tynions series is great!Not only does Tynion make stories that are better and less convoluted than the flagship title (Batman), but he also has a way of making side characters I could otherwise care less about matter. James Tynion continues to show what a great super hero team book is all about. In each volume we dive more into what makes the Bat family tick. Batman: Detective Comics, Vol. 1: Rise of the Batmen focused more on Tim Drake and Batman's second in command of the Bat Family unit, Batwoman. Batman: Detective Comics, Vol. 2: The Victim Syndicate focused more on Spoiler and Clayface . In this volume we get to learn more about Cassandra Cain aka Orphan. I have to admit I have a soft spot for Cassandra Cain. Many a Batman fan has told me her run as Batgirl was incredible. Tynion does a good job not only capturing the voice of Cain but also the books tone has changed to match the character's psyche. I really enjoyed this book. The villain, Lady Shiva, had some exciting scenes and I really enjoyed her back and forth with Orphan. The artwork was a bit sketchy and not that great in some issues, but ultimately it was the story that won me over. Sometimes I wish I collected this series instead of the Tom King Batman. I am not saying King's Batman book is bad it is just Tynion's book is more fun. I really loved the set up for the coming Dark Days and Dark Nights Metal event. Having the flashback with Tim Drake was a nice touch at the back end of the book. The Batman creative team continues to give us some of the best Batman stories around. This I have actual read volume 1 of Detective Comics: Rebirth, but this one is the one I want to review first. This is the "Batman Team book" of DC Comics right now and it is a very interesting book. I did not read this series at first, but the buzz over it got the better of me. The story is good, but depending on how you look at it, shows one of the weak-points of the Rebirth project in-general. The tendency to redo pre-Flashpoint stories only works if they can stand on their own.The focus on this story is Cassandra Cain, the Batgirl during the early 2000s. I plan to review the second volume of that run soon, but this run has her under her pre-Batgirl codename: Orphan. We see her backstory get established and it comes back to haunt her and her team as very terrifying mother comes calling. This story is a composite story of her two original storylines as Batgirl. The thing is, if you do not know this, then this story feels a little out of nowhere. This is one of the few blind-spots of DC Rebirth. If I had not been reading Kelley Puckett's run on the character concurrently, I would have been lost through half of the story. Beyond that, it is a good story and because it did not introduce her father yet (oh boy) it can be revisited in the future. This was a great volume. It's everything I wanted in a comic book. I really like what they're doing in this series. HELL YES!While Batman flounders, Detective Comics flourishes!It was only a matter of time before the focus finally went to Cassandra Cain who is be far my favourite DC character! So I had high hops for this one and they were exceeded. The League of Shadows have struck and soon every member of Team Batman is taken down by the badass that is Lady Shiva. Everyone that is except Cassandra Cain the Orphan! James Tynion IV did my fave justice and issues 955 and 956 had me jumping with gleeWhat I love about this book is not just the wonderful characterisations of the Bat Family and the action packed stories, but the mysteries and the seeds that get planted and will grow over future issues. By the end of this arc Jame Tynion IV teases you with some of the things the group will come up against and I cannot wait!The arc had a couple of artists, but I'd like to single one out, Marcio Takara whose energetic and gritty fight scenes were just jaw dropping. Just look at one of the splash pages in 955, you'll know it when you see it. 'Batman: Detective Comics, Vol. 3: League of Shadows' by James Tynion IV with a host of artists focuses on team member Orphan and unleashes a crazy set of attacks of Batman's team and Gotham.The new Batman team features Clayface, Batwoman, Batwing, Azrael and Orphan. Cassandra Cain, Orphan, doesn't want to talk. In this volume, which collects Detective Comics #950-956, we find out who her mother is. Her mother is Lady Shiva and she may be involved in the mythical League of Shadows. Before things are done, Batman's team will have to rely on Orphan's skill to save them, and when that skill is unleashed, it's a pretty amazing thing.I read the Rise of the Batmen arc, and while I liked it, I felt a bit lost. I love Clayface being part of this team, but at the time, I wasn't familiar with the Cass character, but she has some great, weighty dramatic moments here. Her arc feels a bit different from similar "dark" characters and I appreciated it. I really liked this story. It's smart and action packed. The art pulls everything together. I received a review copy of this graphic novel from DC Entertainment and NetGalley in exchange for an honest review. Thank you for allowing me to review this graphic novel. The story itself is ok, at best. Batman suddenly forgetting that the League of Shadows is a real thing is initially so puzzling that it took me right out of the story, though it is explained later. However, the character work in this volume, especially on Cassandra, is excellent. Cassandra is awesome, and I love her, but I think a lot of people just aren't sure what to do with her. It's tough to figure out what to do with largely mute character who's had such an incredibly traumatic childhood. Batwoman also comes off great here. She doesn't have a lot of page time, but she does shine when she does show up. And Tynion has just done a remarkable job with Clayface throughout his run on this book. So the story's mediocre, but I still want to read this book because I like what Tynion is doing with the characters. DC Comics has several series on Batman running at the same time and Detective Comics is one of the longest running series not only in DC Comics’ history but also in comic history in general. This volume collects Detective Comics issues #950-956. Here it focuses on Batman fighting a villainous group called the League of Shadows.One of the things that I noticed in this volume is how this is more of a story focused on a team rather than just Batman the solo hero. We see an array of characters and sidekicks from Batwoman, Robin, Nightwing, etc. The story began with readers meeting Cassandra Cain, a lady who is behind the hero named “Orphan.” In fact much of the story is directly tied to her origin and background as readers will soon discover. She’s a character that is rather new to me and I thought the first issue with her talking about her upbringing by her father to become an assassin and how she has problem communicating was interesting for this is a story of a hero who is troubled, flawed and she knows it. There’s an element to the way the writer and artist presenting her inner thoughts that makes it more believable and invokes empathy for the character. I really found the character Cassandra Cain compelling and a strong lead in this volume. First off she’s stronger than Batman and even Batman admits in the story that she can kill Batman. Secondly she’s someone who was raised in a worldview that is completely opposite of that of Batman in which she is trained to murder at a whole different level of fighting than the rest of the villains and heroes in the story but you see her living out what Batman believes in not taking a human life. Of course to hold to Batman’s value as her own she inevitably clashes with the ghosts of her past which becomes incarnate so to speak when the league of shadows emerges and eventually lead Cassandra to face her own mother.From the previous paragraph I hope it is evident that I enjoyed the story in this work. At the same time I felt there were some drawbacks. For a work on Batman this has way too many sidekicks than what I’m used to. It felt somewhat crowded. Which might not be a problem for other heroes and superheroes but there’s something to Batman that is rather aloof even when he has others helping him. Having so many sidekicks seem to also pull away from the Cassandra Cain storyline which seems to be the main thing in the volume. Also I thought there were times where the story got a little bit unbelievable even for a world of DC Comics superhero. There are moments where various members in Batman’s team get severely injured only for them to somehow get freed and back in action right away. Now I know it is not real life and it is just comics but the writer and artist has it as their intention to describe how lethal the enemies are and how much devastation they can cause but it was rather distracting and took away from their emphasis on the powerful attacks and coordination of the enemy when Batman’s sidekicks could just somehow be in the fight so quickly and at times without explanation how they got themselves back together. Also I felt this story presupposes a lot of what went on before in volume one; I had to go back to volume one to situate what is going on in volume three and I’m not sure if I needed to know what’s in volume two for the story to be more complete (I happen to have not read volume two). I wished maybe perhaps in the beginning of the book it could have told us where it was picking up from or filling in some of the details in summary form in the same way Batman volume one and two did in the New 52 series. Batman: Detective Comics, Vol. 3: League of Shadows by James Tynion IV is moving along very well and it is doing so by taking the biggest risk any Batman comic can do. It is making Batman into a supporting character. This series is about the team and the individual members more then it is about the Dark Knight himself. Which is one of the reasons I enjoyed this story arc so much. It is about the League of Shadows. It is about Lady Shiva. It is about Cassandra Cain, the once Batgirl; the Orphan.The League of Shadows, under the leadership of Lady Shiva invade Gotham. What they are after is unsure but the rampage they are on is muderous. Batman and his team must face off against the League but they are terribly outclassed and still reeling from the loss of Tim Drake, Red Robin, who sacrificed himself to save the city.Batman must even align himself with his most deadly enemies to fight the League and Lady Shiva. But what they do not understand is what Shiva is truly up to. What she has come to Gotham for. She has come to claim what is hers. Her child. Her daughter. Cassandra Cain.Cassandra Cain is one of the most unique characters in the Batman universe. She is a killer, trained by her father to be the foremost assassin in the world. She has battled her own father and mother and even Batman himself. What Cassandra wants most though, is to belong. To be part of a family. She had it once when she was Batgirl and now, as the Orphan, she is trying to find a way back. The moments of Cassandra watching the ballerina dancer and mimicky her moves is a brilliant stroke by Tynion. It speaks to the deep well of loneliness in her. The loss of childhood, of just being a little girl. There was no horrible tragedy that took this from her as it did to Bruce Wayne. No, for Cassandra it was a calculated move on her father's part. The people who should have loved her the most, are the ones who hurt her the most.And now her mother has come for her. Will Cassandra survive? A terrific arc in the Batman universe. This one collects Detetive Comics 950-956. I received an advance reading copy of this book, for free, through Goodreads First Reads program in exchange for my honest review.The last Batman graphic novel I read was Frank Miller’s The Dark Knight Returns 30 plus years ago. Having not read the previous two volumes in the Batman: Detective Comics series, I was concerned about my review being hindered by a lack of context. Thankfully, the people running the giveaway at DC Comics enclosed a copy of the DC Essential Graphic Novels 2017 catalog when they sent me my copy of this graphic novel. Using the catalog, I was able to identify the titles of the first two volumes in the series (Vol. 1: Rise of the Batmen & Vol. 2: The Victim Syndicate). Googling those titles and reading a synopsis of each, gave me at least a cursory knowledge of what had occurred in the series up to this point. A powerful and mysterious enemy has attacked. Batman has teamed up with Batwoman to train an elite force of young superheroes with the goal of protecting the citizens of Gotham City. 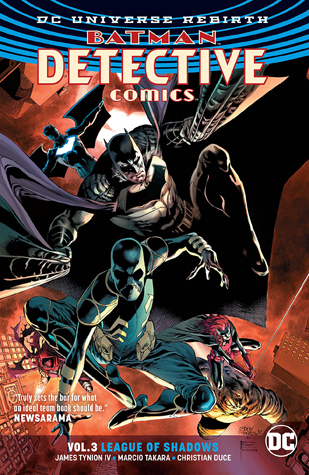 The story continues in Batman: Detective Comics, Vol. 3: League of Shadows, by James Tynion IV. Vol. 3 focuses primarily on one of the young members of Batman’s team, Cassandra Cain, aka Orphan. Orphan emerges as one of the stronger members of the group; however, she is conflicted by a great deal of inner turmoil. League of Shadows is fast-paced and action-packed. The illustrations are fantastic, and the story is an interesting one. However, as is to be expected in such a series, very little is resolved when it concludes. Instead, readers are left to wait for the next installment to be released to see how things will play out.As someone who doesn’t read many comics, I read this graphic novel in one day, and found it to be a lot of fun. Someone who follows these characters, and is familiar with the storyline, will probably enjoy it much more than I did. My only warning would be that it is dark and full of violence; therefore I would not recommend it for children. 2.5 Un aprobado.La parte de Cassandra al principio fue muy emocional e interesante, mientras que todo lo que pasa con Azrael no tuvo demasiado sentido para mi. La verdad es que él es un personaje que no conocía, pero puede resultar interesante. La conversación entre Tim y Batman fue total y completamente para propósitos de hacer hype a una nueva serie de batman, lo que me decepcionó un poco, pero funcionó a su propósito, me dio curiosidad sobre Dark Days.Sinceramente la acusación de que batman había sido el asesino del alcalde recientemente inspirado a hacer el bien me hace rechinar los dientes, pero a ver como se desenvuelven Shiva y the League of Assassins.Me resultó un poco sacado de la manga que Shiva sea la madre de Cassandra, pero en fin.Predecible la pelea madre-hija, y lo demás también es el típico: oh-no-héroes-derrotados, no hay manera de arreglas esto. La conversación entre R'as y Batman me gustó, de lo mejor de este tomo.La verdad es que ver la lucha colosal de Cassandra contra toda la liga de las sombras fue bastante épico. Por cierto, de que manera más rápida e impresionante consiguió el guionista hacer que odiara con todas mis fuerzas a Ulises, y eso que RedRobin no es santo de mi deboción.El final un tanto flojito.En conclusión un tomo bastante normal, que ciertamente no creo que relea nunca, si acaso lo más destacable es la historia de Cas, pero eso también fue bastante cliché; eso si, me encanta su personaje y lo diferente que es a todos los demás. La verdad sea dicha lo que más impacto me causó fue el imbécil de Ulises y las ganas que me dieron de que alguien lo matara. I continue to really enjoy James Tynion's work on Batman. Despite this volume being a story on the mysterious League of Shadows, this story is almost entirely about Cassandra Cain, Orphan. I am not personally very well verse on her history but the backend stories I have been following since The New 52 ended make her very interesting and full of a ton of heart. The prologue at the beginning of the volume really helped set her up as the broken hero trying to find purpose in her life. The reader just cant help but cheer her on as she tries to find purpose, protect her friends, and ultimately cope with the biggest surprise she never would have seen coming. At one point nearing the end of the volume, I was cheering for her as she basically made a new friend out of someone who initially was afraid of her while ultimately learning who she is and how she has been living her life upstairs of the ballet theater.The Batman family continues to grow and expand with the addition of Batwing and Azrael. I remember being aware of Azrael's debut back during the early 90's so it was nice to see he still has a place in the DC universe. Again, I need to credit the writing of Tynion by creating thought provoking dialogue based on religious themes and how it has helped Azrael in his way of life. Its very refreshing. I definitely recommend this volume and cant help but feel there is going to be some insane number of future story arcs that can come from just this volume in itself. Throughout Tynion's Detective Comics run, Batman's been denying the existence of the League of Shadows. Now, as you can tell from this volume's title, he must confront it head on. (The reason he's been so wrong so far? Ugh, I'll get to that later.) The real focus of this collection, though, is Orphan, aka Cassandra Cain, aka the Pre-New-52 Batgirl who wore the black outfit. We get a little backstory on her, a little perspective on what it's like to be in her head, and a lot of fighting from a young lady who was bred to kill. The biggest downside for me from a story perspective is that I think Batman is a character who should be grounded in reality (as much as that is possible for a superhero), meaning scientific gadgets and CSI-level criminology are fine, but not the Harry-Potter stuff, and we get a little dabbling into the arcane arts (which may increase in the next volume). (view spoiler)[The Batman mindwipe was already used in Identity Crisis, by the way. I don't think that's something that needs to be introduced into the Rebirth version of this character.... (hide spoiler)] Additionally, the art in this volume is not fantastic. The earlier Rebirth Detective Comics volumes worked better.I received a preview copy of this book from NetGalley. Many of the problems that plague modern Batman stories are on display in this offering. The worst offenses are the mania to always top what has come before , and forgetting what has happened in the current book that is being written. The League of Shadows may have appeared in a comic before, but the bat team hasn't met them. But don't worry, they are the most important threat that Batman has ever faced. They are so evil that they can stab you over and over again without hurting you or leaving any holes in your clothes. On the forgotten what just happened in the story front, we have Batman getting his arm broken, but being back to normal on the next page. The superheroes are chained up naked, for some reason, but are dressed in clean, new non-stabbed or bleed on costumes. ( we are given some lip service to recovering from injuries, but only after the plot has been resolved).Bonus crimes include a teenager fighting one hundred or so ninjas that are so good that they can never be put in jail. The same character learns to use grammar in a way that is linguistically impossible. And the classic hidden parent reveal. It's bad but it's not as terrible as King's run has been. Finally, in this third volume of the new-look Batman Detective Comics, the ultimate big bad of the series rears her head. That is, I think she's the big bad. Or rather, the League of Shadows, funded by Ra's al-Ghul, lead by Orphan's psycho-killer mother, is the big bad. I hope I'm right about that because it sure does seem like Batman is hinting a yet larger threat still exists. Whatever, man. Three volumes in, I'm sick of the "it's only gonna get worse" rhetoric. Give me the ultimate villain and just move on. Also, let me know what's happening with Robin plz thx.That grumbling aside, this is a fine volume. The first volume focused on Batwoman, the second on Spoiler, this third one on Orphan. She being the silent but deadly character, I was intrigued to see her voiceover take control for one issue. She also certainly proves her mettle in numerous fight scenes. Batman, on the other hand, comes off as pretty weak in this volume, quickly overcome by Lady Shiva. I'm fine with seeing him in peril, but at least make the peril worth it. 3.5 Stars.This Volume should be called "The Redemption of Orphan". Cassandra Cain takes the spotlight in this team (Batman, Batwoman, Orphan, Batwing, Clayface, and Azrael) title this time around when Lady Shiva, leader of the League of Shadows (not to be confused with the League of Assassins which is led by Ra's Al Ghul) returns to Gotham, not only to take it over and destroy it, but to see how her daughter (revealed here as Orphan) is doing.While the events are mostly resolved within the Volume, we do have some loose ends: The Colony, which Kate's father is leader of, is still out there, causing havoc. Ra's revealed that he had tampered with some of Batman's memories. Tim reveals to Bruce that he sees a lot of preparation being made for war (teasing the upcoming "Dark Days" storyline). Overall, this was a solid book. I hope we have finally seen the end of the dark times for Cassandra, as she deserves to have some happiness in her life, but we, the readers, will ultimately see. Recommend. An excellent finish to a longer-developing arc. This was a larger sized story that, although technically contained within this volume, had been subplot of growing importance and significance as "the larger thing happening in the background" through out the series to this point. Nice build that felt natural and then Tynion & co. bring off their climactic arc nicely. I was especially glad that they explained why it is Batman would be denying the existence of the League of Shadows. That was really bugging me. Some great team stuff here, as the group continues to tighten and become more effective, and some nice character moments especially with Cassandra/Orphan. The rest of the crew (including Batman and Batwoman) are mostly action heroes in this one, but they never quite shrink to two dimensions, they're just not in up-close character focus. James Tynion IV - Prior to his first professional work, Tynion was a student of Scott Snyder's at Sarah Lawrence College. A few years later, he worked as for Vertigo as Fables editor Shelly Bond's intern. In late 2011, with DC deciding to give Batman (written by Snyder) a back up feature, Tynion was brought in by request of Snyder to script the back ups he had plotted. Tynion would later do the same with the Batman Annual #1, which was also co-plotted by Snyder. Beginning in September 2012, with DC's 0 issue month for the New 52, Tynion will be writing Talon, with art by Guillem March. In early 2013 it was announced that he'd take over writing duties for Red Hood and the Outlaws in April.Tynion is also currently one of the writers in a rotating team in the weekly Batman Eternal series.